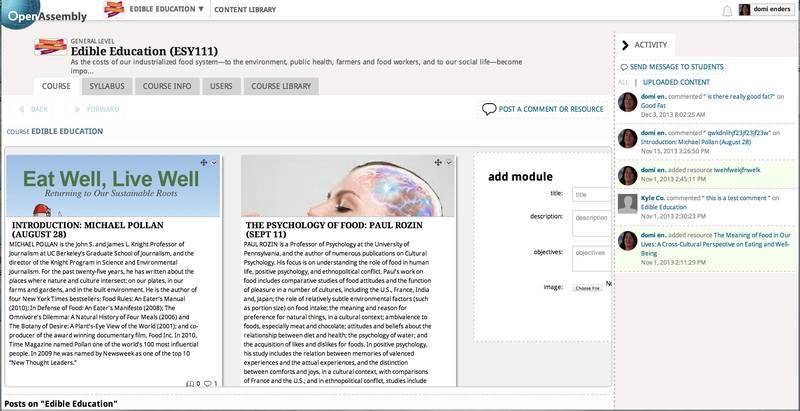 Open Assembly is a free, cloud-based platform for social learning, collaborative teaching, and content curation using open textbooks, open courseware, and other open educational resources (OER). By unleashing the Power of Open, we’re encouraging innovation based on networked learning in hybrid and online environments. The platform is free for any user–students, self-learners, instructors, admins, institutions–for open education purposes. Assemble a playlist of learning resources. Remix, adapt, or clone an existing playlist. Share it with a colleague or peer, at the course or module level. Engage with comments and resources of your own. Analyze engagement. Archive only what you want to keep when the course or project is over. Take it with you on your learning path from course to course, or from one learning goal to another. Accessible on any web-enabled browser device. Open Assembly can be used in numerous ways: to create a playlist or course, to assemble a digital curriculum, a coursepack or collection of resources, and to undertake research, on your own or better yet, in collaboration with others. Our goal is to make teaching and learning online more accessible, more engaging, more interactive, and a lot more intuitive. We’re setting a new standard for teaching and learning with others. We combine teacher-centric and learner-centric tools, which makes us learning-centric.